This time luck visited a parking lot attendant from Wilmington. 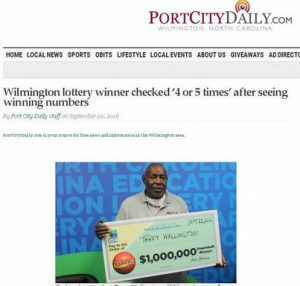 Terry Wallington said he cried tears of joy on learning he had won a million dollars playing the Powerball lottery. Wallington received $692,500 after the taxman took his cut. The winner says most of his plans are for giving – helping his brother and sister and giving to charity. As for himself, he is content living the way he has for years, but may consider trading an 18 year old car for a used Cadillac.